Model 384Z-10300-0001, 300 DPI, 4 IPS Print Speed, 8MB DRAM, 4MB Flash, Serial, Parallel, USB, US Plug, ZPL Language. Discontinued - Call for replacement. Model 384Z-10300-0041, 300 DPI, 4 IPS Print Speed, 8MB DRAM, 12MB Flash, Serial, Parallel, USB, Real Time Clock, US Plug, ZPL Language. Discontinued - Call for replacement. Model 384Z-10301-0001, 300 DPI, 4 IPS Print Speed, 8MB DRAM, 4MB Flash, Dispenser, Serial, Parallel, USB, US Plug, ZPL Language. Discontinued - Call for replacement. Model 384Z-10302-0001, 300 DPI, 4 IPS Print Speed, 8MB DRAM, 4MB Flash, Cutter, Serial, Parallel, USB, US Plug, ZPL Language. Discontinued - Call for replacement. 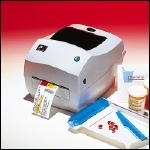 Model 384Z-10400-0001, 300 DPI, 4 IPS Print Speed, 8MB DRAM, 4MB Flash, Serial, 10Base-T Prt Server, US Plug, ZPL Language. Discontinued - Call for replacement. Model 384Z-10401-0001, 300 DPI, 4 IPS Print Speed, 8MB DRAM, 4MB Flash, Dispenser, Serial, 10Base-T Prt Server, US Plug, ZPL Language. Discontinued - Call for replacement. Model 384Z-10402-0001, 300 DPI, 4 IPS Print Speed, 8MB DRAM, 4MB Flash, Cutter, Serial, 10Base-T Prt Server, US Plug, ZPL Language. Discontinued - Call for replacement.